Scuba Radishes can be found within the farthest depths of Lake Chocodunk. Radley Madish created special diving helmets for these radishes so he could bring some added security to his underwater lair. 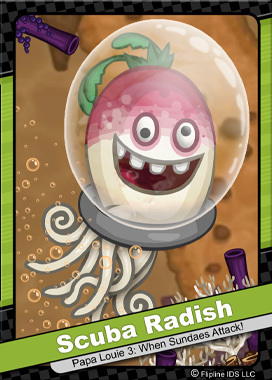 Unfortunately, Scuba Radishes don’t make the best swimmers and have a very difficult time controlling their direction. Regardless of their swimming chops, they still manage to follow Radley’s simple plan of causing aquatic chaos. ← Sneak Peek: Papa Louie Pals!? !